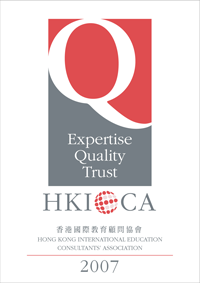 Members of HKIECA are governed by its Constitution and this Code of Conduct, which aims to promote a high professional standard of ethical business practice among HKIECA’s members. This Code of Conduct represents the minimum standards which HKIECA members are required to follow. Members shall faithfully carry out the duties which they undertake, and shall have proper regard for the interests of those who seek their services. Members shall endeavour to contribute through their work to the promotion and advancement of the industry. Members shall avoid actions and situations inconsistent with their legal or contractual obligations or likely to raise doubts about their integrity. Members shall not maliciously endeavour to discredit other members of HKIECA. Members shall abide by this Code of Conduct and other Codes which may be promulgated from time to time by HKIECA’s Executive Committee. Members shall provide accurate, complete and honest information, as provided by education providers, to student and parent enquirers. Members shall make every effort to ensure that accurate information is provided to enable students and parents to exercise an informed judgment in making their choice of education provider. Members shall recommend suitable study programmes appropriate to the student’s academic standard and English proficiency. Members shall not knowingly misrepresent the nature and resources of education providers to students or their parents. Members shall provide clear and explicit information at an early stage about their charges for services, if any. Members shall provide pre-departure support to ensure accommodation, guardians, visas, air tickets and airport pickup (as necessary) are arranged for students. Members shall provide after sales service by maintaining contact with education providers, students and parents. Information provided by students and parents shall be treated as confidential and all members must comply with the Personal Data (Privacy) Ordinance of Hong Kong. Members shall not retain original documents obtained from students. Should this exceptionally be necessary, members shall always provide a receipt for original documents temporarily retained. Members shall not guarantee places on behalf of education providers. Members shall not discount tuition fees or offer rewards as incentives to enrolment. Members shall provide an honest assessment of students to education providers regarding academic standards, qualifications and behaviour. Members shall adhere to their contracts or agreements with education providers. Members shall remit, or instruct students or their parents to remit, all fees by banker’s draft or telegraphic transfer directly to education providers. Members shall not knowingly be a party to any attempt by students or their parents to deceive any visa-issuing authority. All advertising or other publicity initiated by a member on behalf of an education provider shall be in a form and manner agreed to by the education provider. Members shall not intentionally mislead members of the public in their advertisements. All advertising and promotions by members shall comply with their contracts and agreements with education providers.